The Southernmost Point Guest House has something for everyone, our rooms are roomy and elegantly styled, each in a subtle tropical theme. 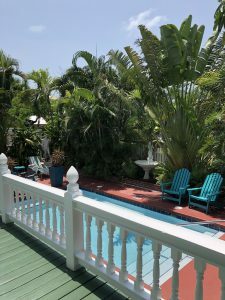 Our ocean view accommodations in Key West, FL, will leave you feeling relaxed and recharged, with the ocean just a glance away. This room features a private porch and a queen size bed. This room features a king bed, queen sleeper sofa bed, full kitchen and a beautiful private balcony overlooking the Southernmost Point Buoy & Atlantic Ocean. This room features a king bed, queen sleeper sofa bed, full kitchen, separate living room and a beautiful balcony overlooking the Atlantic Ocean. *Rates vary depending on room size, location and dates of stay. Rates are based on double occupancy and are subject to change on weekends, holidays and special events. Check in time: 3:00 pm – 7:00pm. Check out time: 11:00 am. Office closes promptly at 8:00pm. Cancellation 7 days prior to arrival except during holidays and special events. Extra person rate per night: $20. Rollaway bed $20. Crib: complimentary. Minimum night’s stay during holidays, special events and weekends. To secure a reservation at our bed and breakfast, we require all information along with a valid credit card, expiration date, and security code. Located on Historic Duval Street.